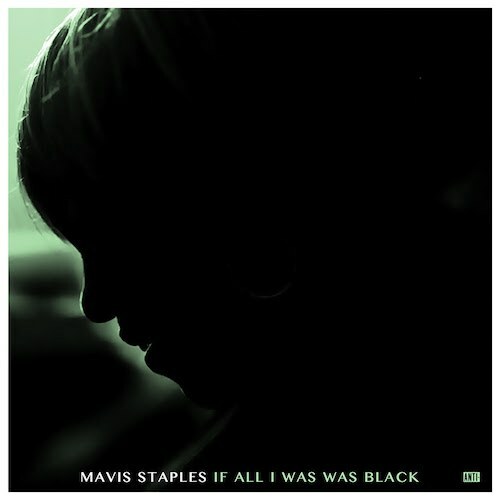 Is Mavis Staples one of the greatest people alive? Her new album If All I Was Was Black would suggest so. For nearly seven decades Mavis Staples has been singing songs of freedom, equality and empowerment. She began singing with her father Roebuck (“Pops”) Staples along with her siblings Cleotha, Yvonne and Pervis in Chicago in the fifties. Mavis became known as the little girl with a deep voice, and combined with the group’s unique blend of gospel and blues, The Staple Singers created an unparalleled sound. Soon, their music would become the essential accompaniment to the civil rights movement. The group was influenced by the nonviolent message of Dr Martin Luther King. Pops Staples struck up a friendship with the leader, telling his children that if Dr King could preach it, they could sing it. Dr King himself was a fan of the group, and regularly invited the Staples to perform before his public appearances. They would record songs such as ‘Why (Are We Treated So Bad)‘ and ‘When Will We Be Paid‘, which would become important civil rights anthems. Then their later recordings at Stax Records turned the group into a soul act, but the message in their music was remained the same: justice, respect and love. In recent years, Mavis has continued the legacy of The Staple Singers during her solo career. She’s worked with the likes of Steve Cropper on her first solo albums, and then with Prince in the eighties, although annoyingly these albums have been long out of print. In recent years Mavis has enjoyed a renaissance with two collaborations with Wilco frontman Jeff Tweedy (the first, You Are Not Alone, won Mavis her first Grammy Award), and last year’s excellent Livin’ On A High Note produced by M. Ward where Mavis deliberately wanted positive songs to sing (check out Ward’s spiritual ‘MLK Song’). Yet, since then, times have changed. America has changed, and many of the attitudes and beliefs that Mavis fought against in the fifties and sixties have returned to the political mainstream. White nationalism, police brutality and declining standards of living for African-Americans weigh heavy on her mind, and she has been helped by Jeff Tweedy to put her feelings down on record on If All I Was Was Black. The album cover to ‘If All I Was Was Black’. Whilst she never mentions him by name, the album is no doubt intended as a clear rebuke to the presidency of Donald J. Trump and the beliefs he and his supports hold. Mavis pulls no punches on the album: she’s angry and cannot stand aside while the man in the obviously fake hair takes America back to an era best left in the past. The album’s opening track pulls no punches. On the opener ‘Little Bit’, Staples sings about police brutality, and the outrageously high number of black men being shot by police, singing that: “Poor kid, they caught him/Without his license/That ain’t why they shot him/They say he was fighting, so/That’s What we were told/But we all know/That ain’t how the story goes“. The rest of the album follows in a similar vein. The album’s title track poses the question “if all I was was black, would you want to know me more than that?” You can’t come to the sad conclusion that for some in America (and probably post-Brexit referendum Britain) the answer is no. Staples is undoubtedly angry, but she sheds a light on modern America with unrivalled clarity. She doesn’t let her anger boil into rage, but instead tries to forge a path ahead, with her years of experience and trademark positivity. There’s an urgency about the album, as if to say stop talking and start acting, a sentiment Dr King would no doubt have approved. As she sings on “No Time for Crying”, there’s no time for tears when America has work to do. The album isn’t all anger, though. There are plenty of positive moments and uplifting songs, that are designed to give hope in desperate times. On “Peaceful Dream” she sings over a sparse gospel arrangement, urging the listener to share with her anger and pain, and that together they we “can get through the darkest days of our lives”. On “We Go High” Tweedy and Staples borrow from Michelle Obama’s 2016 Democratic National Convention speech when she urged Americans to not follow the Trump-era Republicans to the depths of decency. On the song Staples sings that although they are “telling their lies” also “we still know they’re human”. Tweedy’s lyrical cleverness continues with “Build A Bridge”, a clear rebuke to Trump’s plan to build (a so far nonexistent) big, beautiful wall. Interestingly, and something he no doubt was very aware of writing these songs, Jeff Tweedy is a white man. In an era of hyper cultural sensitivity and accusations of cultural appropriation, should he really be the one critiquing white America? As a white man myself, it’s probably not for me to answer, other than to say that it clearly doesn’t bother Mavis Staples. If she saw his race as a barrier to pointing out some hard and uncomfortbable truths about American society, she wouldn’t have recorded the album. Thankfully for us she did, and she’s given us one of the best albums of her prolific career. Staples, at 78, is back to singing protest songs, still marching down that freedom highway. After all, sad to say, she has experienced this all this before. But then if anyone can navigate their way through the Trump era, it’s Mavis Staples. If All I Was Was Black is a blunt, angry yet poignant rebuke to Donald Trump’s America. She doesn’t let her anger boil into rage, but instead tries to forge a path ahead, with her years of experience and trademark positivity. The album is a reminder that the issues Mavis and her family sang about in the sixities are still unresolved. Far from being nostaligic, If All I Was Was Black is a foreful reminder that the civil rights struggle is not over in America, and nor will it likely be under the current administration. As Mavis said in a recent interview with Rolling Stone: “I’ve never taken “Freedom Highway” out of my set, because I knew we weren’t finished, my work wasn’t finished. But I never thought I’d have to go this far“.